Base constructed of Lucite® acrylic. Durable, stain resistant, color fast and easy to clean with liquid detergent and damp cloth. Base is steel reinforced, center drain and integrated tile flange. The advantage of using an acrylic shower base is constructed of non-porous Lucite® acrylic which soap, oil and chemicals in the water does not adhere to the material. 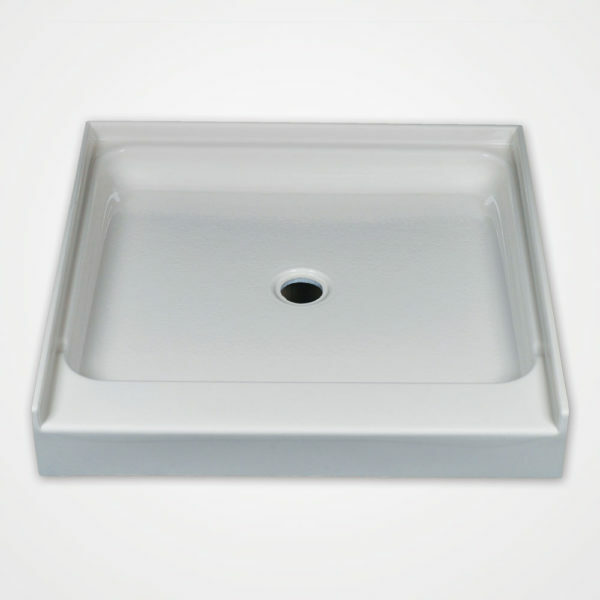 Unlike fiberglass shower bases, the surface is porous which soaps and oils attach to the fiberglass surface making it very difficult to keep clean. Tile floor bases have many grout lines which are also very difficult to keep clean and sealed and sometimes leak over time. Consider a Watertech acrylic shower base as a smart investment for your bathroom. Price – $275, Shipping – Please call for shipping to your location. If a shower pan is ordered with a whirlpool bath, there is no shipping charge on the shower base.